Lea Marquez Peterson answers questions from the press following the 2nd Congressional District debate on Oct. 9, 2018. 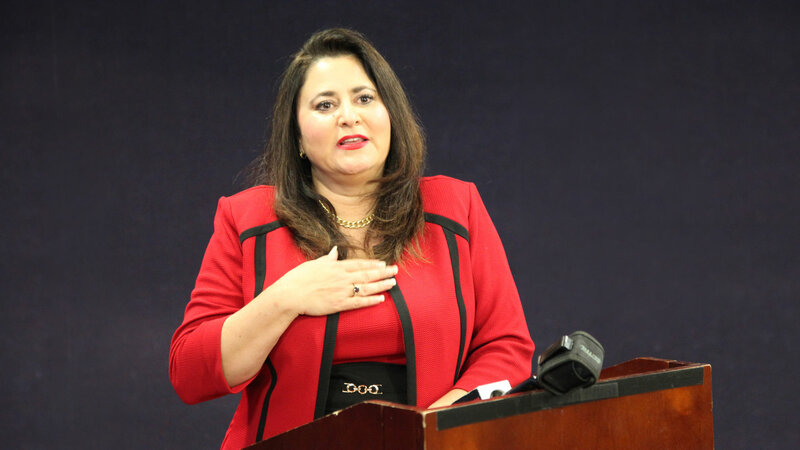 Lea Marquez Peterson has announced she is leaving the Tucson Hispanic Chamber of Commerce. She took over the reins of the organization in 2009 but spent much of the last year running for the U.S. House in Southern Arizona's 2nd Congressional District. She said it is time to move on. "I was ready for a new thing to tackle, a new adventure. I had previously kind of built and led Greater Tucson Leadership," Marquez Peterson said, referring to a community development arm of the Tucson Chamber of Commerce. "And I had done the Tucson Hispanic Chamber since 2009, so, just looking for something new," Marquez Peterson told AZPM. She said during her time at the chamber, membership grew sixfold, from 300 members to 1,800. Marquez Peterson said she does not have a solid plan for her future and will do consulting work for the time being. She did not rule out another run for public office.